Rope Access in Glasgow is one of the specialty roofing repair services that we at Balmore Specialist Contracts offer for buildings that have difficult to access and high roof locations that cannot be accessed with conventional scaffolding. Our rope access roofing repairs and maintenance team offer a quick and cost effective alternative to other means of high height access including cranes, cherry pickers and scaffolding. The Balmore Rope Access team are all full time Rope Access roofers and inspection professionals and proudly fix and maintain roofs across Glasgow. 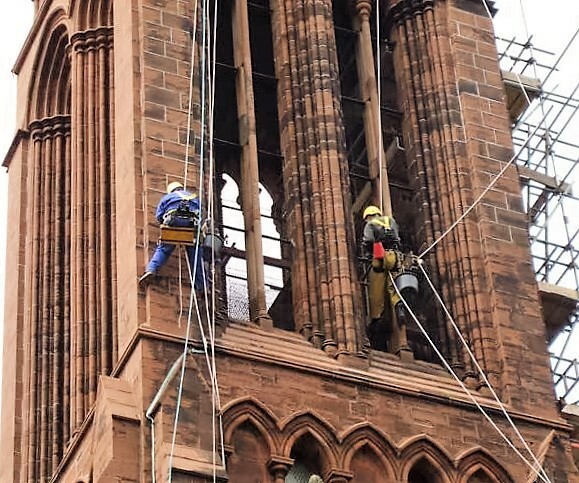 Our team are experts in steeplejack repairs, lead works and other specialist repair and maintenance works that are required by so many of the historic buildings of Glasgow. With the wide range of historic buildings, listed buildings and conservation structures, our team have built up years of high quality experience in working at height using rope access in Glasgow buildings and structures to conduct inspections, maintenance, repairs, cleaning, audits and more. With over 30 years of experience in the roofing industry, Balmore Specialist Contracts can utilise our skills in rope access to provide both commercial and residential roof repairs to property owners in Glasgow. By using Rope Access in Glasgow, we can offer a quicker, cheaper alternative to scaffolding.